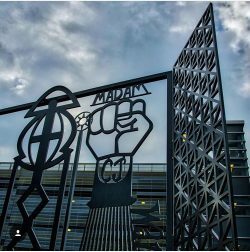 In honor of Black History Month, the entire month of February, we’re going to be highlighting Talking Wall by Bernard Williams which is a giant sculpture install on the Indianapolis Cultural Trail: A Legacy of Gene and Marilyn Glick near IUPUI campus. What most people don’t realize about the placement of this art piece is the significance of the placement. 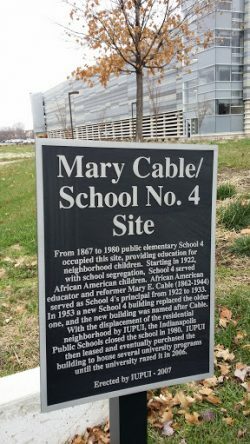 It is on the former site of the Mary Cable Indianapolis Public School 4. This was the first black elementary school during the segregation era. Mary Cable was a prominent educator in the Ransom Place community, principle of the school, and the first president of the Indiana NAACP, a chapter she organized herself. Cable also worked diligently to work with the district to prepare more than 60 African American teachers to enter the classroom. The IU Foundation purchased the building in the late 1960s and the IUPUI University Theatre moved into the building. The theatre was home to many student and children’s productions throughout the 1980s and began dwindling in the 1990s. The theatre closed in 1993 and demolished in 2004 to provide additional space for the University to grow. The site is now honored with a historical marker and the Talking Wall Sculpture. Over the next 3 weeks, we’re going to be looking more into the people and symbols in the sculpture.